When I first moved into my current house the faucet in the bathtub leaked. Since it was leaking into a drain and not onto the floor it was one of those things that are easy to put off. But it sure felt good when I finally got it fixed. I had learned to live with the leaky sound but the silence after it was gone was beautiful. Well hopefully you’ll never find out in real life. 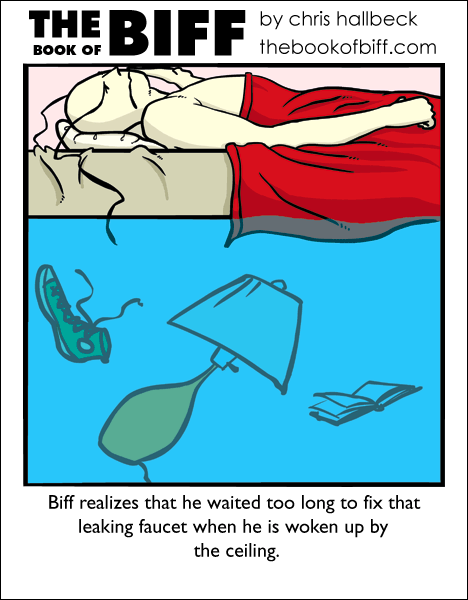 Yeah, somehow I don’t think Biff is worried about electrocution. That makes me want to be a plumber, but that has nothing to do with the comic…oh well. Nice one though I liked it. Hahah, ok, that was rather cryptic. Sorry I happen to do that from time to time. Call it impulse behavior or just a random observation and now i will shut up. All real, all true, and based on real events! Wet eyebrows. I hate that. Three words. OH. MY. GOD. Yes, it’s another person from one of those banner ads…they’re addicting. He could have left the faucet on or he could have a pipe leaK or he could have a pipe burst or he could have frozen pipes and all the extra water came out the wrong end. Thanks Knownimus. This one was fun to draw. Actually, I just thought of something. As soon as the water covered up the faucet… wouldn’t it be unable to put out any more water? If I remember correctly, once the pressure is equal on both sides – which it isn’t normally, since the water pump is pushing it out of the faucet via higher pressure than the outside air – which it would be since the water would be pushing back just as hard as the pump was pushing water out of the tap. after I get used to any noise that is constant and slightly annoying, I actually need that noise to exist for me to get anything done. Like I cant sleep without the news radio on (WBUR for me). Hey, welcome darktrb. Yeah I know a few people that need white noise like a fan of some sort to sleep. Jetman123, what if the leak was on the floor above? Of course, he was bending water. I’ve been woken up by the ceiling before. But that’s because my brother kicked the bottom of the top bunk and launched me into it haha. Love the “comic-is-world” effect in this one, and the floating lamp is absolutely fantastic. He never would have been woken by the ceiling if he was still sleeping in the matress. I left a tap on filling the bath when I was a kid. It didn’t make my bed float, it just soaked through the floor and made rain in the garage. Looks like a water main break. Biff will now have to do some unintentional skinny dipping to get free. I love how he is woke up by… the top border of the comic! There is a great little kiwi movie that is somewhat similair to this. A tap in the house starts leaking and the occupants just “ignore” it. They all pretty much die. Actually, something sorta similar to this happened to me. thankfully, I was not in that house (or sleeping on that bed) when it did. During hurricane Katrina, my dad’s house got flooded, and at the time, my bed was an air matress. So we come back after everything, and find that everything is completly soaked, except for the things on the air matress, because the air matress floated above the water. The pressure would have to be greater PUSHING INTO THE PIPE, which could take a while. Otacon, no! Don’t be a plumber! They get attacked by evil turtles and mushrooms and sentient bombs and stuff! Waaah, Biffs poor holy sneakers! ..Well, hello, Mr. Ceiling. Imagine meeting you here. When my sister was two or so she stuffed cotton balls in the sink drain on the ground floor and then left the water running. Six hours later, there was standing water throughout that entire storey.